Phosphate-free special shampoo based on nonionic and anionic surfactants as well as re-greasing skin protection agents, which prevent the skin from drying out. The surfactants used are biodegradable according to OECD criteria. 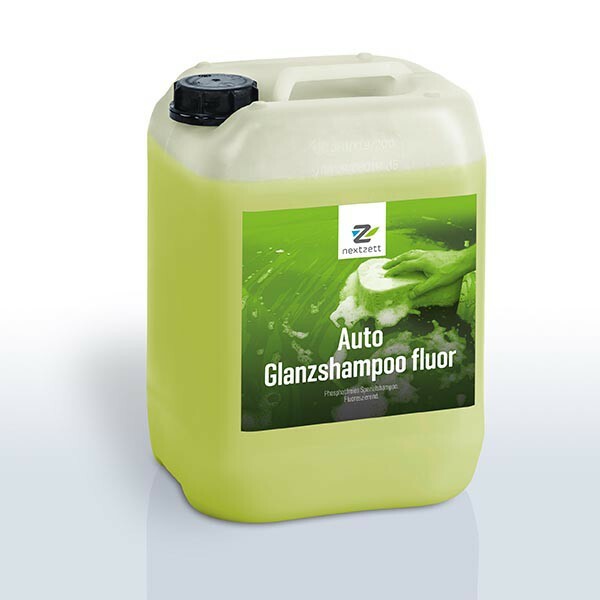 Autoglanzshampoo Fluor is a highly concentrated shampoo for the gentle care of all smooth, glossy surfaces in the household and car sector. nextzett Car Glanzshampoo fluorine is a phosphate-free special shampoo on the basis of anionic surfactants and rehydrating skin protectants. The surfactants used in the formulation are fully biodegradable according to the EC Detergent Regulation 648/2004 Annex III. nextzett Car Glanzshampoo fluorine is a modern, highly concentrated shampoo for the gentle care of all smooth, shiny surfaces in the household and automotive trade. Nextzett Auto-Glanzshampoo fluorine cleans gently plastic, glass, tiles, lacquered surfaces, upholstery and other high-quality surfaces. For basic cleaning of hard surfaces about 20-40 ml nextzett Car Glanzshampoo fluorine enter into a bucket and fill it with lukewarm water to 10 L. For a better mixing, use a sharp water jet at short notice, or foam the product in a bucket. Then use a sponge to shampoo the surfaces to be cleaned. When cleaning, make sure that the sponge is always washed out in the bucket, otherwise dirt particles are trapped and microscratches remain on the paint. For this reason always remove coarse soiling with a sharp water jet. After shampooing, rinse the surface thoroughly with clean water and let it dry. The result is a streak-free gloss.